In celebration and recognition of Police Week, May 13-19, 2018, Mesa County Sheriff's Office Color Guard presents the colors at the administrative public hearing of the Mesa County Commissioners on Monday. Mesa County Sheriff's Office Color Guard proceeds to the public hearing room to present the colors in honor of Police Week, which honors the brave men and women who work to serve and protect our community. This week, the Board of Mesa County Commissioners honored law enforcement by declaring May 13-19, 2018, as Police Week in Mesa County. 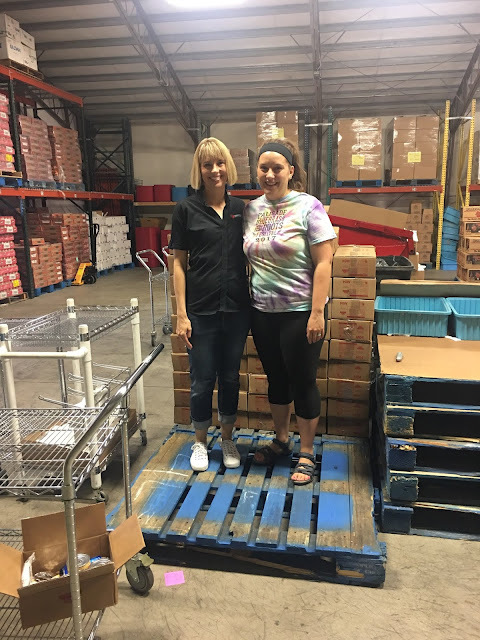 Elections hosted a tour of their office with some of the 2018 Primary Election candidates to help acclimate them with important election dates and processes. Commissioner Scott McInnis talks to KKCO 11 News Anchor Crispin Havener about why Mesa County is a great place to live. See the interview at https://bit.ly/2IxCx4v. On Monday, Officer Barnes coaxed a dog (tiny troublemaker) that had been running at large and had been difficult to catch. On Wednesday, Mesa County Criminal Justice Services Shift Supervisor James Bruner, left, and Criminal Justice Officer Chad Music grilled burgers to help raise funds for the CJSD Partners Superstars Team. 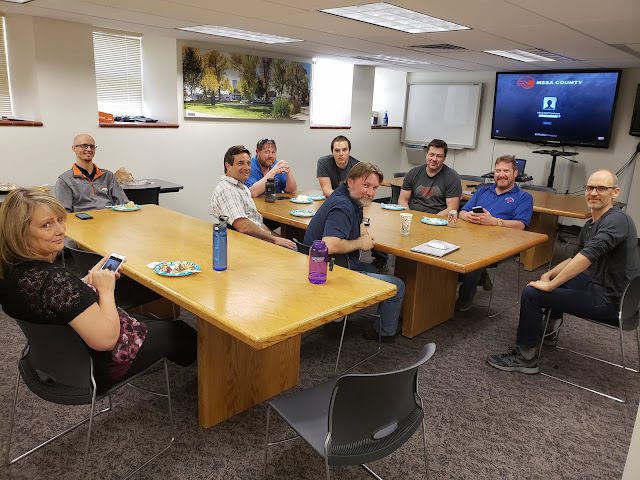 CJSD hosted an employee BBQ to benefit Mesa County Partners, a program that makes a difference in the lives of young people by helping them develop a positive self-image, a sense of belonging, and acceptance of responsibility for their actions. Great turnout at CJSD's fundraising event to benefit Mesa County Partners. Mesa County employees enjoy food and refreshments at CJSD's fundraising BBQ luncheon. Tickets for the meal were priced at $10 to raise money for Partners, a local youth program. Representing the Clerk's office, Bobbie Gross and Sheila Reiner attended the ThinkHR training offered at the Workforce building on Wednesday. Mary Cornforth, left, and Katie Goddeyne of MCPH volunteered for Kids Aid on Friday as part of their Grand Valley Leadership Academy Service Learning Project. 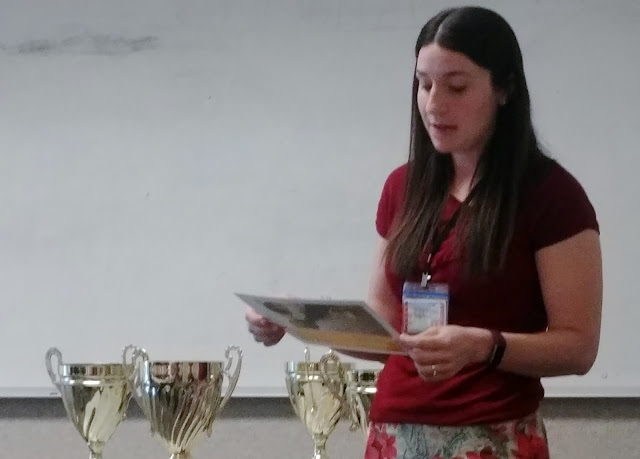 Megan Ballard from Adult Services reads her nomination for May Values Champion. 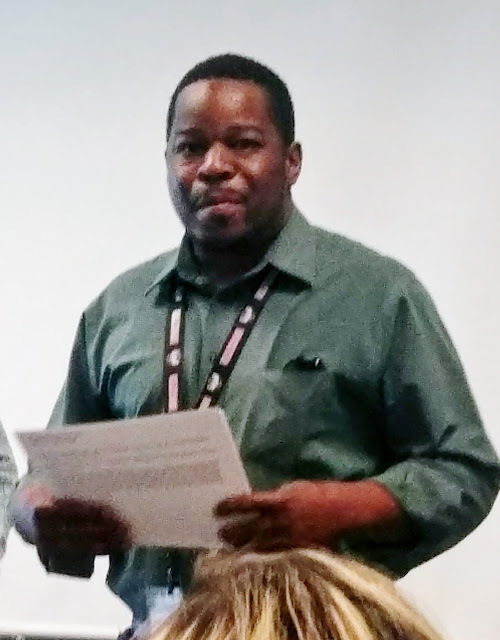 Michael Smith from the Workforce Center reads his team nomination for Values Champion. May Values Champions and nominees: Linda Fino, Amanda Pennington, Tracey Garchar, Kylie Mayfield, Rhonda Johnson, Victor Carreras, Celina Kirnberger, Erika Rodiguez, Kasey Watts. 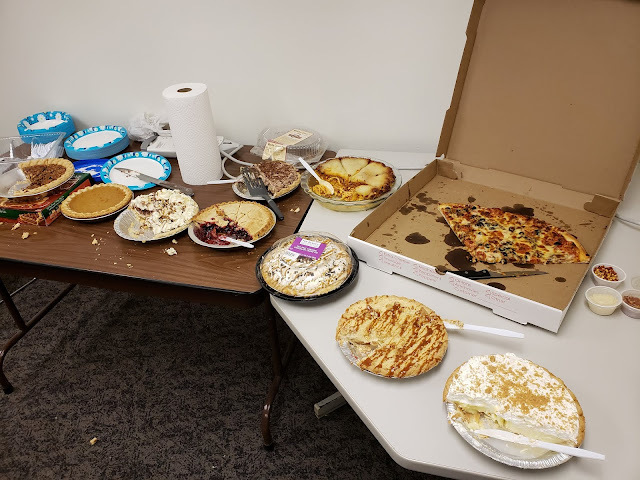 Mesa County Information Technology (IT) staff got together to go over team updates and project status reports, over pie. No pie shortage here. No wonder everyone in IT is so sweet. Mesa County Fairgrounds staff is hard at work getting the ground ready for the TRAXXAS Monster Truck show. A lot of preparation work happens behind the scenes before shows are hosted at the Mesa County Fairgrounds. R-5 High School students visit the Mesa County Compost facility to learn about organic matter. R-5 students took a tour of the compost facility and learned about why keeping green waste out of the landfill and diverting it to a compost facility is important. The collected organic matter goes to the compost facility at the Mesa County Landfill and is turned into compost instead of being buried with trash that is not being recycled. Mesa County Solid Waste Director Barret Jensen teaches students how organic matter is processed and converted into compost. Mesa County Solid Waste Director Barret Jensen shows students how Mesa Magic is made and how it is packaged. Mesa Magic, a compost product, is low in salt and high in organic matter. Mesa Magic is screened to 1/2" minus and 1/4" minus, which is excellent for gardens and soil building before seeding or top dressing lawns and adding to planters. R-5 High School students received hands-on training on how to process and bag compost. Mesa Magic is an approved participant in the United States Composting Council's Seal of Testing Assurance program. As part of an outdoor project day, R-5 students visited the Mesa County Compost facility and got to take the fruits of their labor. Mesa County Solid Waste Management donated several bags of compost to R-5 High School. The Board of Mesa County Commissioners kicks off the 2018 Inside Mesa County (IMC) class. What’s Inside Mesa County? It is a 9-week, in-depth class that allows citizens to look inside every aspect of Mesa County government. IMC attendees get to hear what a day in the “life of a Mesa County Commissioner” looks like from Commissioner Scott McInnis' perspective. Future sessions will feature the Assessor, Clerk and Recorder, County Attorney, Coroner, District Attorney, Sheriff, Surveyor, and Treasurer, as well as Animal Services, Criminal Justice Services, Department of Human Services, Public Health, and Public Works. It’s not every day you see a wall removed! This panel was removed as part of a project to fix the kitchen at the detention facility. Meals are being served through a temporary kitchen while crews fix this one.